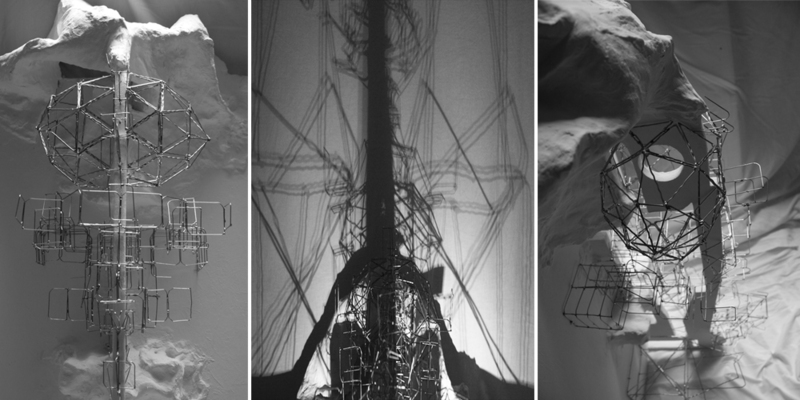 Mesh is a single-screen video that combines a multiplicity of audio-visual transformations extracted from the embodied physicality of a sculpture (86cm x 50cm). Dynamic form is governed by the relationship between object and transformation of spatial materiality. The model becomes a three dimensional 'machine for shooting', that directly questions our sense of spatial-temporal perception through the passive engage of fractured abstraction. The overall result, is not to reproduce a real space, but to create a persuasive environment stylized to suspend disbelief, set between the real and artificial. There are no characters in the film, off-screen presence is articulated purely by the motion of sound and light projected across the surface of the model. The light transforms the surface, revealing unseen design characteristics that exist in its inherent architectural form. The addition of sound, further articulates these characteristics, the resulting audio-visual material can be seen as 'actors' coordinated to form a series of identifiable audio-visual scenes. The adoption of visual methodologies, when applied to the composition of music, investigates an intersection of new territories that dissolve pre-existing conventional distinctions. Mesh was the result of an international collaboration with Sebastian Edin (SE) commissioned by DIEM (Danish Inistute of Electroacoustic Music). Realised at DIEM under auspices of the Royal Academy of Music, Denmark.